Architects Anne Marie Singer and Nina Cooke John from Frame Design Lab like to explore every possible option for a project. 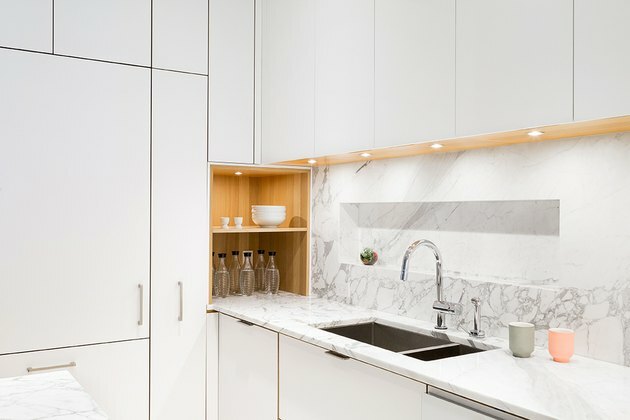 So when a couple with a young son sought an inventive way to update their New York City apartment, Singer and John were eager to consider a few possibilities before finding the perfect fit. 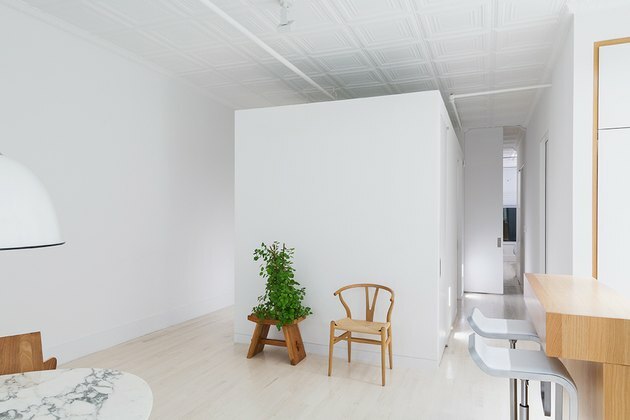 The couple, who both work in creative industries, wanted their cramped Chelsea address to meet the differing needs of more space and more privacy, all within the confines of a two-bedroom apartment. They asked for a master bathroom, two walk-in closets, a laundry room, and a guest room — and it was Singer and John's jobs to come up with some inventive ideas. Their most unusual one ended up being the winner. Singer and John devised a plan for a "floating cube" sitting in the middle of the layout, which would have lowered walls to let light easily filter across the space. 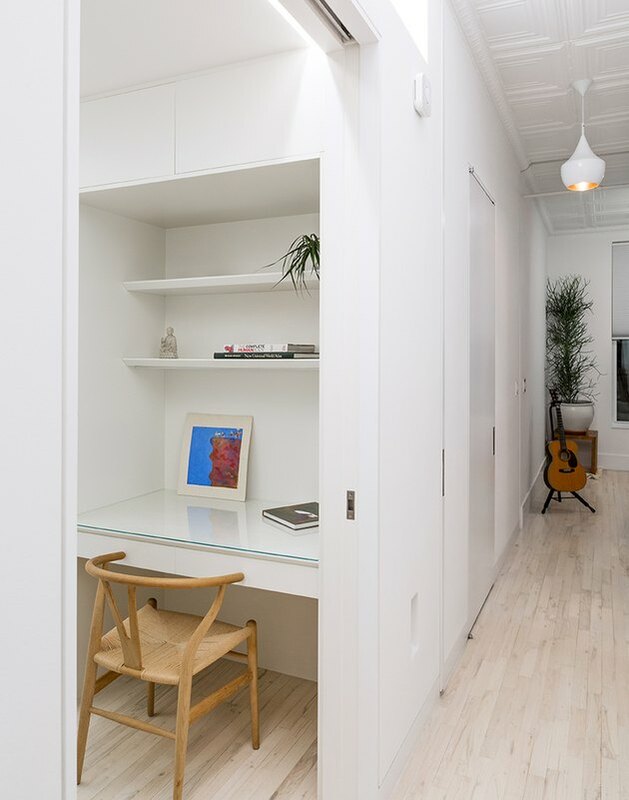 Now, sliding doors separate this private office from the surrounding two bedrooms, and the rest of the property features a calm palette that gives the airy illusion of more square footage. 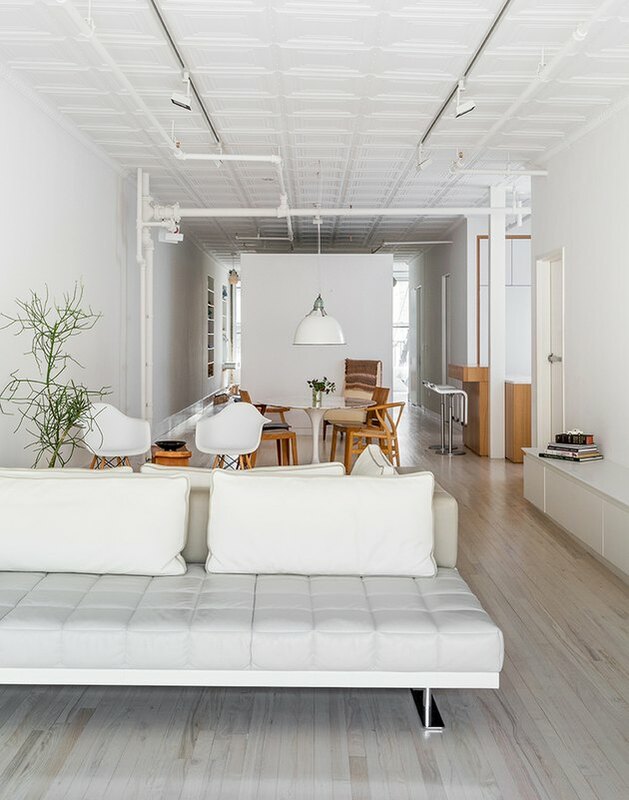 A white shade of paint from Benjamin Moore covers the walls, as painted tin tiles line the ceiling. Wall-washer lights by ERCO illuminate the area, and a custom-made mirror by Frame Design Lab — fabricated by Dog Productions — brings in even more light. 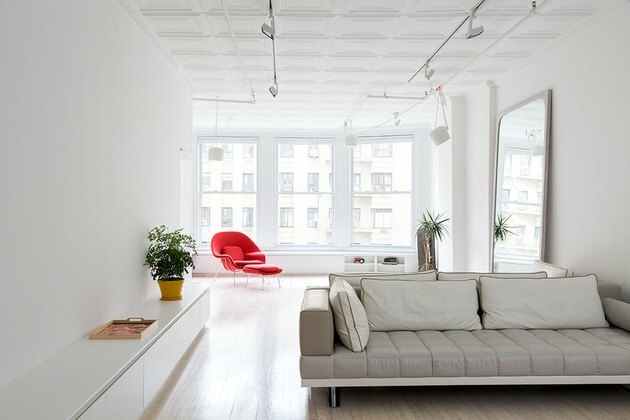 The Grid sofa from Resource Furniture is a custom-built modular couch. 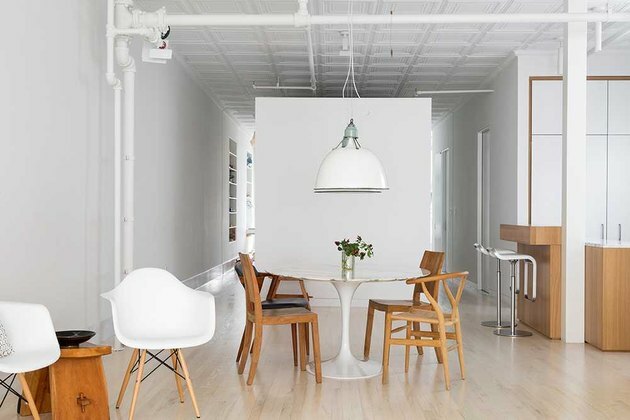 It sits above a white-stained, solid white oak floor. 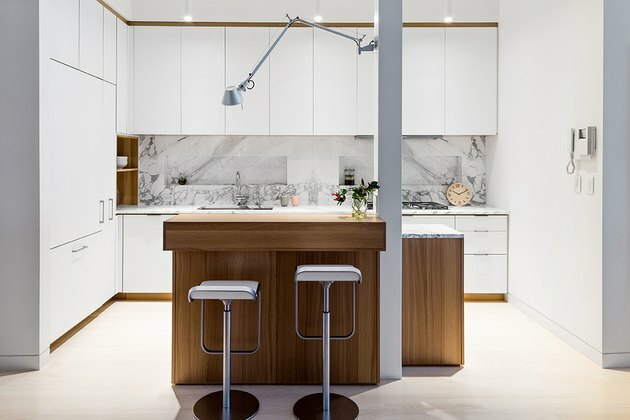 Transforming a cramped apartment into an expansive living space required the design team to think outside of the box — literally. 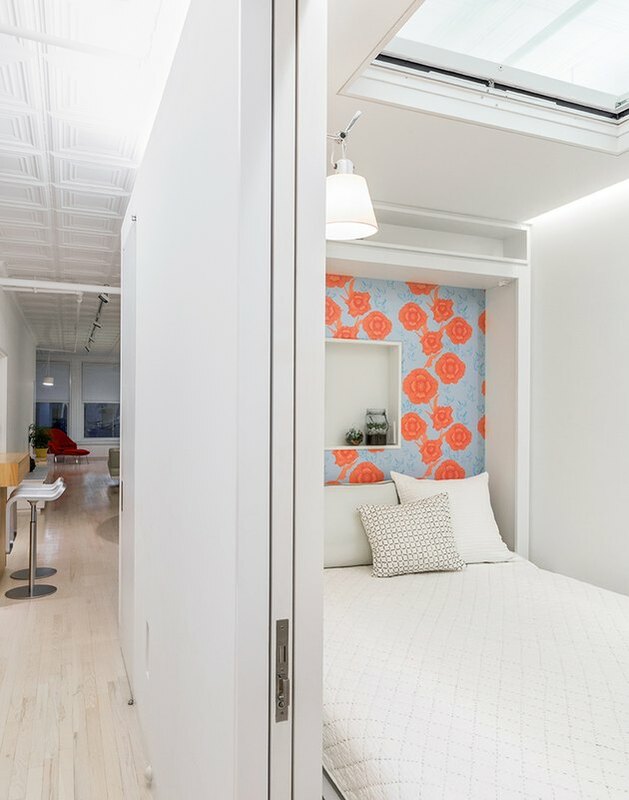 A square "floating" room with a lowered ceiling functions as a private entity inside the open floor plan, and allows natural light to flow through the apartment. A full-height solid wood sliding pocket door was designed by Frame Design Lab with hardware by Hafele. Millwork shelves were also custom-made by the firm. A dining area was arranged using a lot of the client's previous furnishings, including a Saarinen Tulip Table, a hanging light reclaimed from the Plaza Hotel, and a mix of dining room chairs. The firm custom-made the bar, and it was fabricated by Henry Built. Bar stools by Lem Piston Stools and a Statuary Marble backsplash mirror the textures in the Saarinen Tulip Table. A silver lamp by Artemide Tolomeo hangs over the bar. The cabinets were custom-made by Frame Design Lab and fabricated by HenryBuilt, and the sink is by by Blanco Steelart. A faucet by Grohe has a setting that provides filtered, chilled sparkling water. In the bedroom, all-white walls are interrupted by a fun "Poppy Flower" wallpaper design from Camilla Meijer. To maintain a sense of privacy, a sliding door functions as a barrier between the shared spaces and the personal space. 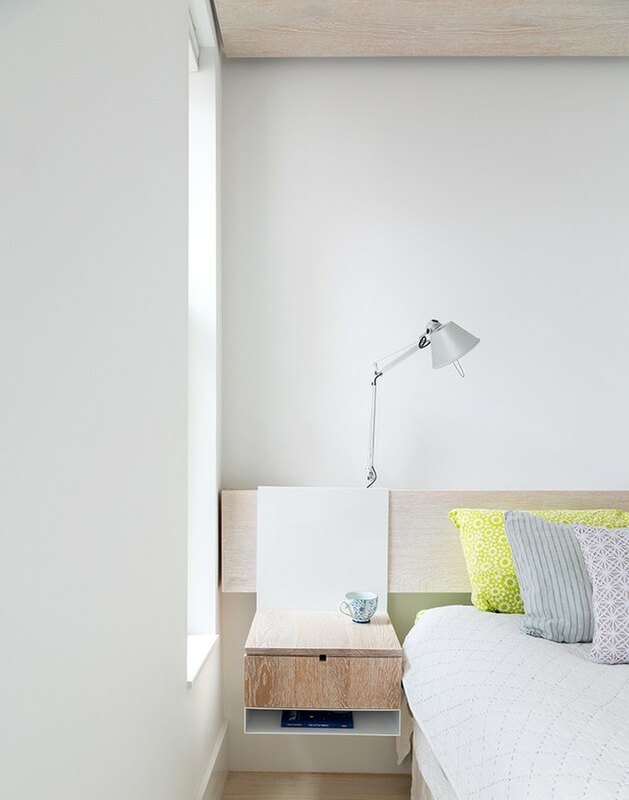 A skylight by Velux and a wall sconce by Artemide Tolomeo are situated above the bed. In a design similar to the other bedroom, lights from Artemide Tolomeo and panes by Skyline Windows make the most of natural light. A custom, white-washed solid oak bed fits in perfectly. 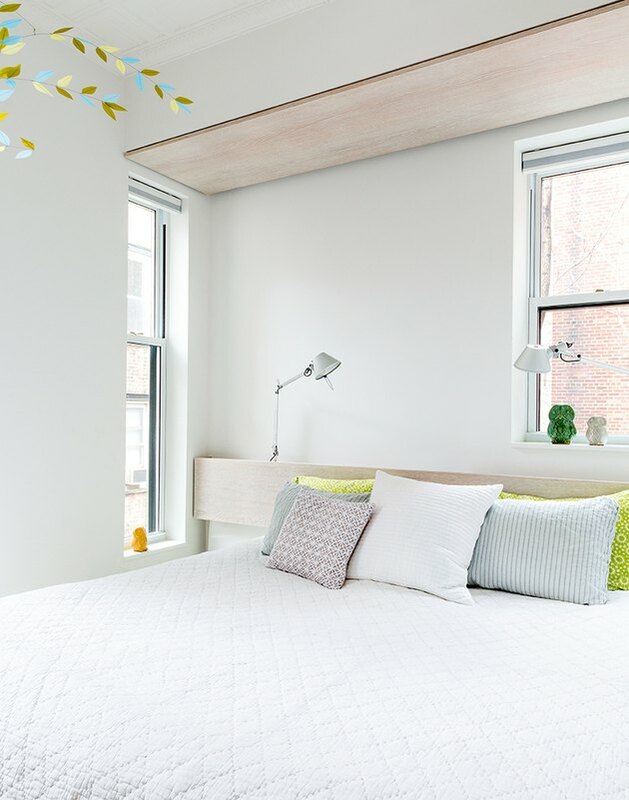 The custom headboard and side tables — made from custom white-washed solid white oak and a white powder-coated steel — seem to be suspended in a similar fashion to the "floating box."